Bus from Shah Alam to Muar is the only direct service connecting two cities. With the increasing demand of the direct bus from Shah Alam to Muar, the frequency of the bus service has increased over time. Transnasional, Mayang Sari and Cepat Sedia are the three reputable and reliable service providers offering bus from Shah Alam to Muar. Their combined trips have total 9 departures daily from Shah Alam Bus Terminal to Perhentian Bas Ekspress Bentayan Muar (also known as Muar Bus Terminal). Both Transnasional and Cepat Sedia deploy VIP coach to run this bus service while Mayang Sari is using standard 44 seater coach. The difference between VIP coach and standard 44 seat coach is the seat layout. VIP coach serves the spacious seat with 3-seat-in-a-row seat layout while 44 seater coach serve the standard seat with 4-seat-in-a-row seat layout. The bus fare of Shah Alam to Muar costs about RM 19.80. It comes with RM 2.00 – RM 3.00 premium price as compared to bus fare of KL to Muar at RM 17.60. This is because the boarding service at Shah Alam saves the passengers time and money to travel to Kuala Lumpur bus station for boarding. 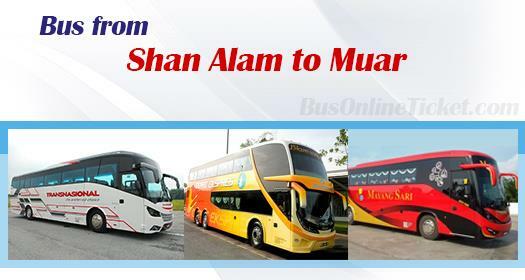 Duration required for bus from Shah Alam to Muar takes about 3 hours depending on traffic condition. Stopover will be provided upon request. Due to high demand for bus service from Shah Alam to Muar, passengers are advised to booking online in advance with BusOnlineTicket.com to avoid disappointment. In the event of all buses are full, then passengers can proceed to Kuala Lumpur bus station for alternative bus service. BusOnlineTicket.com has emerged as the most popular online booking portal among its customers throughout these years because of its excellent consistent service.